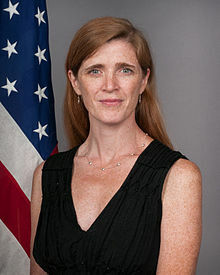 Samantha Power (born September 21, 1970 in Dublin, Ireland) is an Irish-born American academic and diplomat. She was the United States Ambassador to the United Nations. She was a senior adviser to Barack Obama. She ended that job in March 2008. She is listed as the 63rd most powerful woman in the world by Forbes. Power was born in Ireland. She moved to Pittsburgh when she was nine. She graduated from Yale University in 1992. ↑ "The World's 100 Most Powerful Women". Forbes. Retrieved 28 October 2014. ↑ "Samantha Power Takes on the Job of a Lifetime as Ambassador to the U.N." Vogue. Retrieved 28 October 2014. This page was last changed on 21 September 2017, at 14:06.